Mental health experts say the hundreds of documents seized from the childhood home of Adam Lanza, the Sandy Hook school shooter, may provide lessons for parents on how to help children struggling with developmental disorders and anti-social tendencies. 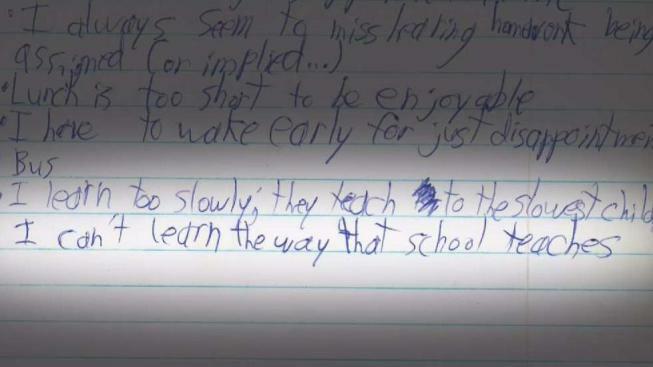 The files, including drawings and writings from Lanza's youth, report cards, and childhood development evaluations, reveal family members and educators struggling to help the future killer cope with autism, obsessive compulsive disorder, and the extreme isolation that ultimately rendered Lanza a frustrated teenage recluse. The 1,400-plus pages of material were first obtained and reported on by the Hartford Courant after the newspaper won a five-year court battle with Connecticut State Police. After NBC New York filed a records request seeking the same documents, the I-Team shared the files with experts in the field of childhood development and psychotherapy. Jeremy Veenstra-VanderWeele, M.D., director of child and adolescent psychiatry at Columbia University, said it is important to dispel the myth that Adam Lanza's autism somehow prompted his violence. "Autism spectrum disorder actually would be expected to decrease the risk of planned or intentional violence," Veenstra-VanderWheel said. "At a certain point, it feels like something opened a door and evil walked in. These are evil acts. They’re not things we can understand from the perspective of mental illness." Adam Lanza's list of "school aversions"
Though mental health evaluations cannot reliably predict violent behavior, Veenstra-VanderWeele said anxiety and problems with self-expression can lead to reclusive tendencies where violent ambitions are harbored -- without parents or peers knowing. According to the files released by police, Lanza had a strong aversion to the Sandy Hook school building, describing it as "unsanitary" and writing "I can’t learn the way that school teaches." Because of his aversion to the school environment, Lanza’s mother allowed him to withdraw and embark on a program of home schooling -- which furthered his isolation. "You want your child’s life to include as many people as possible, and you want their world to grow instead of shrink," Veenstra-VanderWeele said. Frank Bartolomeo, a Wilton, Connecticut, psychotherapist, said the drawings and writings from Lanza’s childhood depict a gradual descent from "neuro-typical" childhood behavior -- like writing Christmas lists and Mother’s Day cards -- to a warped pre-occupation with aggression. Two drawings show the Trix cereal bunny and the Lucky Charms character preparing to beat up children. Another script, co-authored by Lanza, depicts a depraved grandmother who uses her cane to kill children and other characters who play the game "Hide and Go Die." Adam Lanza's "Big Book of Granny"
"I think what you see with Adam Lanza is the intensity of those kinds of drawings and thoughts. It's almost complete with stories of aggression. Of people being hurt by adults. Of children hurting adults," Bartolomeo said. Both Veenstra-VanderWeele and Bartolomeo stressed they never had the opportunity to evaluate Adam Lanza, but they agreed mental health problems are not enough to explain the extreme nature of Lanza’s child murder spree. Still, they suggested there are important messages for all parents of troubled kids in the Adam Lanza story. One of those lessons, they said, is the importance of monitoring a teenager’s online communication and never allowing a teen to become completely isolated from family and peers. "We need to be very conscious of what’s happening in our kids' worlds. So you want to know what they’re doing on the internet," Veenstra-VanderWeele said. "We should have a password to their computer." The I-Team was unable to reach Adam Lanza’s father, Peter Lanza, for comment. But in an interview with The New Yorker, the elder Lanza said he wished his son had never been born and he described his ex-wife, Nancy Lanza, as having become overwhelmed after years of tirelessly trying to help her troubled son cope with his various mental disorders. It’s not clear how much Nancy Lanza knew about her son’s online behavior leading up to the school shooting, but one of the documents released by police reveals Lanza speaks glowingly about anorexia. "Starving is an example of excellent willpower," he wrote. "Only thin people are graceful." In another online exchange, he defends pedophilia, saying "It should be up to the child to decide if it is right or wrong." Bartolomeo said that kind of twisted thinking is more likely to emerge from the kind of isolation Lanza had self-selected. Video released by investigators showed, just before the Sandy Hook massacre, Lanza had been living in a bedroom with blacked out windows, avoiding almost all contact with the outside world. "We're deeply relational and social creatures, and there is evidence that prolonged isolation can lead to changes in the brain's structure and chemistry," Bartolomeo said. One of the most disturbing documents released as part of the Adam Lanza childhood file is a detailed spreadsheet he authored with synopses of mass murders committed across the world. The spreadsheet notes how many were killed, what weapon was used, and what became of the killer. "It’s hard to talk about this without a concept of evil," Veenstra-VanderWeele said.